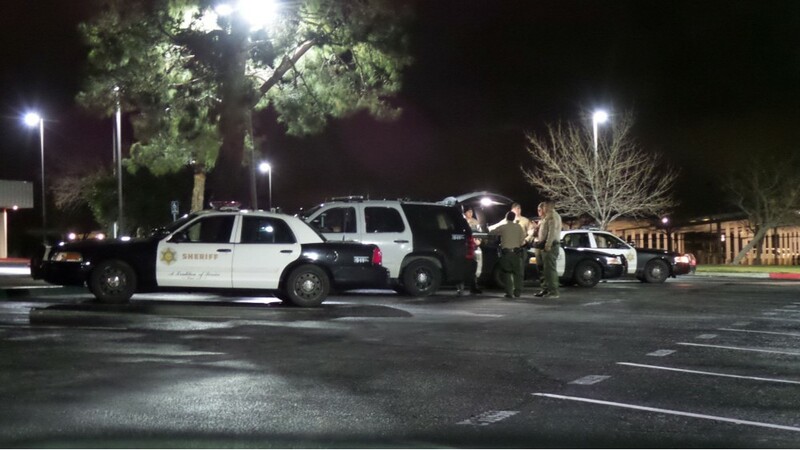 PALMDALE – Three men were killed and one man was wounded Wednesday night in a shooting in Palmdale, authorities said. It happened around 11:15 p.m. Wednesday, Jan. 16, in the area of Ranch Center Drive and 40th Street West, according to a news release from the Sheriff’s Information Bureau. 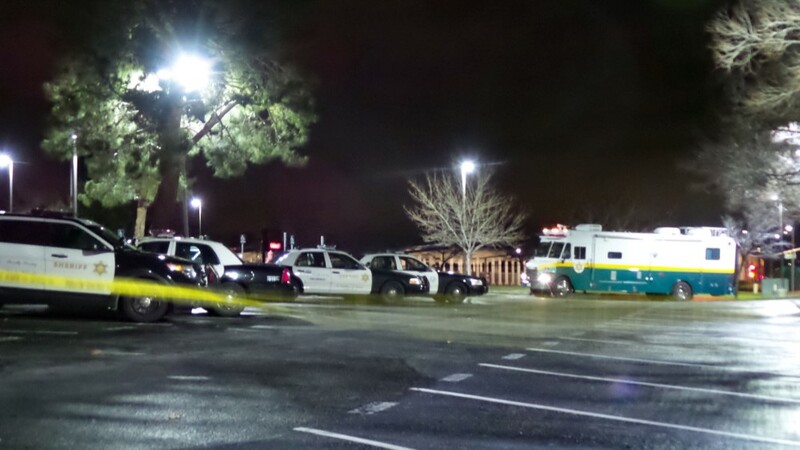 “Detectives have learned that deputies responded to the area of Ranch Center Drive and 40th Street West regarding a call of a gunshot victim. Upon arriving, they discovered four male adult victims in two cars parked at the location, suffering from what appeared to be gunshot wounds. Three of the victims were pronounced dead at the scene, and the fourth victim was transported to a nearby hospital. His condition is unknown,” the sheriff’s news release states. A description of the shooter or shooters as well as a motive was not immediately available. The murder weapon was not recovered, sheriff’s officials said. No further information on the shooting was immediately released. Anyone with information about the shooting is encouraged to call the sheriff’s Homicide Bureau at 323-890-5500 or Crime Stoppers at 800-222- 8477. UPDATE: The victims were identified as Olukayode Owolabi, 27, of Los Angeles; Sean Cowen, 24, of Van Nuys and David Hernandez-Licona, 25, of Los Angeles, according to the Los Angeles County coroner’s office. 83 comments for "Three killed, one wounded in Palmdale shooting [updated]"
Better to stay home and t.v. Any further updates? Just wondering if there is a killer on the loose. I wonder why they didn’t go public with this case. Back to what this article is about. A jewelry designer; a skilled rollerblader; a Latino from Boyle Heights, and a fourth unidentified man were in a rather remote part of Palmdale late at night in two cars, to meet up with unidentified person or persons. Three of these young men were murdered, and one is still living, (shot in the face). The fourth man called 911, and told the dispatcher he did not know where he was, so law enforcement used technology to locate them. Hopefully the facts will come out, and justice will prevail for these young men that got way in over their heads. I’ve said drug deal as a possibility, and though I regret that it hurts your feelings I only suggested it as one possible explanation for a highly unlikely situation. People who are familiar with the location would be very hard pressed to come up with a good, wholesome explanation for people in two cars stopping at that place late at night. You are likely right that no one will ever know for a fact what it was about, but at the very least it supports a lesson for young people that good things don’t happen in strange places very often. In that, their deaths won’t be totally in vain. I have friends close to this investigation. Drugs and money were found in one of the vehicles but it’s not being reported until the investigation is complete. More to follow. Hey, here’s a thought…post who your friends are so we can watch them all justifiably lose their jobs. if a possible antidote for our road rage epidemic would be to have all transportation vehicles 3/4 ton and under have a horn which plays bird chirps instead of the annoying honking sound. Vehicles over 3/4 ton would have a bird whistle, which can not in any way be mistaken for a wolf whistle. rex will steal your idea and claim it as his own kinda like the stuff that his role model trump does. I know it’s hard for a lot of people to believe, but crime in Palmdale is actually down for 2018. It has been on a downward trend for the past 6 years. LASD is still running the numbers and they should be finalized soon. Word is that the Palmdale crime rate went down (again) from the 2017 rate. Why do we need the Lancaster cooperation? We have lowered our crime rate without Lancaster and it will go down again without the Lancaster Cooperation. Why now do we need them?? Palmdale will get under 200 crime rate so lets see Lancasters numbers as they do not use community based policing like Palmdale has for the last 25 years. Marvin and Rex telling their new police chief how to chase crime hasn’t worked yet and its suppose to start working now that were cooperating. Cooperate with Lancaster implies that Lancaster is interested in cooperation…other than in ‘cooperating’ on dragging everyone down to their level, of course. You mean we should have a drone too? I don’t trust any dealings with Lancaster. None whatsoever. Since Palmdale’s crime rate has decreased WITHOUT cooperation from Lancaster, why bother adding their bad ideas to our good policies and progress. .
Plus, we have to keep on eye on Hofbauer, Carrillo, Bishop and Loa in Palmdale. A very close eye as they can’t be trusted either. It would be great for the Antelope Valley if Palmdale and Lancaster had a good working relationship but history has shown that one side of that relationship is corrupt and untrustworthy in addition to normalizing the pathologies of Lancaster’s mayor. Like trump, rex has a coterie of sycophants around him that enable his despicable behavior. And, for some reason, they’ve all grown beards. When Hofbauer and his crew grow them, watch out. To emphasize how bad it is in Lancaster, Palmdale lost a satellite campus for the Antelope Valley College when the college stole the money voted for it to build their auditorium. Then, Antelope Valley Hospital fought and fought the building of Palmdale Regional Medical Center. I don’t know if rex had anything to do with the above but it just shows that the whole city suffers from the same sickness as rex. Dishonesty. So, it’s not just rex & co. that is a problem but other entities in Lancaster. The change of CEOs at that hospital reminds me of the furniture stores in Lancaster that go out of business every year and are replaced by another one that will do the same in another year. Those CEOs get a big buy out and move to another city to do the same I guess. Therefore, they are essentially double-dipping by drawing a new salary somewhere else while at the same time having a large farewell payment to boot. It’s been happening for decades. The point is. Steer clear of Lancaster and it’s leaders. They are no good for Palmdale nor Lancaster either. William, and the other commenters letting Rex live rent free in their heads all day long. They never talk about what the article is about. Obsessed all day long, every day for years. If you read witness statements over 20 shots fired then after ten minutes a single shot…. 3 were murdered immediately then somehow there was a pause before 4th got shot with single gun shot to face….. as a detectives daughter I’d say the injured one got to live with a threat for the rest of his life and to send a message to others he probably was the lay man shot which means there was a ten minute conversation before the single last shot…. shrug but that is a big question mark in my mind… why a ten minute delay and then a single shot to the face? Your ‘ten minute conversation’ theory is certainly exciting, but rooted in flimsy assumptions and highly implausible. First off, witness statements should always be viewed with skepticism. A witness that “hears a gunshot” could have actually heard a whole bunch of things ten minutes after they heard a bunch of shots. Knowing that there was in fact a shooting since they are being asked about it they are going to think everything they heard that might have been a gunshot actually was, but that doesn’t make it so. Second, even if there was a shot after a ten minute delay, there’s no certainty that it was a gunshot that had anything to do with the shooting. A bunch of keyed up Anaverde residents hear a barrage of gunfire, and ten minutes later someone sees a shadow move in their back yard and pops off a round is at least as plausible as your tales of gangland warnings. But, let’s say it was another shot from the same gun. Bullets don’t take a number as they leave the gun, so assuming that the guy who got hit in the face took the last bullet is not supported in any way at all. Here’s an alternative theory for you that has no more support, but at least doesn’t rely on the fanciful TV script ‘gangland warning’ concept. I find out through someone’s loose talk that a drug exchange is going down at a somewhat remote parking lot, so I set up in ambush. I shoot EVERYBODY. Dude gets shot in the face because if I’m shooting at someone who is sitting in a car I ain’t shooting them in the foot. It takes me a few minutes to find the envelope with the cash, and to make sure I got all the dope, and at some point (probably not really ten minutes, but who’s counting?) somebody moves, or moans, or otherwise lets it be known they aren’t dead, so I pop another round into their head. Then I’m gone. One dude makes it, because he had the luck or good sense to not move after he got hit the first time. The key difference in these two theories is plausibility. Start with a fact. There’s a whole neighborhood full of people not a quarter mile away, and the shooting is in a location with very limited access. There are only three ways out, one of them means driving right through the neighborhood where who knows how many people are peeping out their windows and identifying cars. Another involves driving a fair distance down the road that cops are likely to be taking to the scene, again identifying cars for future investigation. So there’s really only one way out, and one way is never a good way. IF there’s a delay and a final shot, under those circumstances there would have to be a really good reason for someone who just shot up a bunch of people to hang around at all. They want to get GONE. Taking time to collect cash and valuable dope is vaguely plausible. “Sending a message” is straight from television. 3 mins from my house in Anaverde. Cops need to be harder in the AV. They just kick back and wait for big things to happen. Ive seen people run stop signs in front of them and they do nothing. Hating Sheriffs. Dumb [removed] lifestyle choices , gangs are a waste of time and sorry for the idiots that are dumb enough to believe that its worth following as a lifestyle … stupid [removed] get recruited at a young age for a reason cuz they re naive and dumb enough to take orders from older [removed] that don’t even care about them in the first place… do better in your life , you only live once don’t waste it on a “ gang” ! Shut up. I know one of the victims. He wasn’t in a gang. He was a well known jewelry designer. Only idiot is the murderer and you. What is a “jewelry designer” doing out in the middle of nowhere at 11:15 pm on a rainy/windy night in January???? Please tell ! Enjoying life? Or trying to. One of the victims was the owner of KayodeCo(jewelry designer) so it was for a fact not gang related!!! Please explain what the hell he was doing at 11:15 PM in a remote area in the rain? Drug deal gone bad? Payback for drug deal ripoff? Where the heck is Ranch Center Drive? Out Lake Elizabeth Road a ways. It’s the back way into Anaverde. Exactly, It’s migrating over here now. First 6 months I lived here, no police activity at all in my area of Desert View Highlands. Last three weeks, much more. One house is being monitored by the sheriff’s office on Elizabeth Lake Rd. Three weeks ago, five black and whites, 2 detective cars and two more big SUV’s were at the house for hours and they were questioning a man outside. Then a week later I saw more heavy police activity on an adjacent road. The Lancaster crime wave is creeping south. They came from L.A., Doc Rivers. We need more bird sounds to drive away the crime. Rex told the Wall Street Journal that his bird sounds were lowering crime city wide. I say we pipe bird sounds all across the Valley and finally eliminate crime. why stop in the valley. Pipe bird sounds around the globe and have world peace and harmony. From the looks of the BLVD, the bird sounds did not lower crime. The bird sounds attracted panhandlers. Can’t any of you comment on this article. This article is NOT about the BLVD, Rex, or bird sounds! Stay on topic, please. What a shame that three young men lost their lives, and the 4th is shot in the face. Bird sounds can reduce cortisol and adrenaline, which are produced by the human body in response to stress. Ever since early man had to worry about forest predators, people found singing birds reassuring. The answer, my friend, is blowing in the wind. Bird sounds will save us. if more research should be done on bird sounds before we expand them. Perhaps one of the sounds is actually the reason for the increased crime as of late. Mr. Focus, I find the dialogue on bird sounds to be exceedingly helpful in the context of this story. Bird sounds can reduce cortisol and adrenaline, which are produced by the human body in response to stress. Ever since early man had to worry about forest predators, people have found singing birds reassuring. If society had an increase in bird sounds it would reduce and eliminate aggressive actions which cause such tragic events. Bird sounds don’t work to eliminate crime. You obviously think they do, Julian. Maybe a Cockatoo or two should be blasted from loud hailers up and down the crime ridden streets. Alexis, Rex said bird sounds lowered crime in Lancaster. He would never lie. You should be glad, Ellen! This means that the Sheriffs are doing their job. Why is there no media coverage ? Why is there no manhunt being made public or asking help from the public ? Yes it really bothers me that there is no manhunt apparently or any fuss over this. They must need to keep this under wraps for some reason. The article says no weapon was recovered. AV Scanners said the weapon used was a rifle, casing had been found and the guy was shot in face. Sooooo… yeah. Not likely he shot himself. There must be a reason they can’t disclose any information. It’s highly possible they do have a lead but in order to follow up on it they need to keep it hush hush. Relax,,,,,, it’s the good old Antelope Valley,,,,, the new Compton! Don’t you have a few crosses to burn there in Tehachapi ? That was about 10+ years ago. Now blacks are destroying the tranquility of all sides of palmdale and lancaster. where are all the poor whites going to move now ? The Black population of Lancaster and Palmdale (both) has dropped since 2010. More are moving out to Kern County (Cal City, Ridgecrest, Mojave, Boron) and to Victorville/Hesperia and even to Las Vegas, Arizona and Texas. California and even the AV are too expensive now for most black people to stay. I know 8 people moving out of the AV as soon as their leases are up. I think you are mixing percentages with raw numbers. Growth in that demographic hasn’t kept up with other demographics, so the percentage has gone down, but the overall number is up…despite this claim that you happen to know a bunch of people who are moving out. There is not that much “growth” here in the AV that I know of. But yeah, tons of my friends have moved out of state to Atlanta, Houston and Vegas. Houston and Vegas are really hot right now and tons of AA ppl moving to both! And like I said, a bunch more is gonna be going when they’re lease up. You can talk about raw numbers and stuff all you want, but I actually talk to people all of the time and they want to go to other places where AA people feel better and fit in more. California isn’t the end-all/be all for most of us. Current census estimates (wait until 2020 for actual data) have Palmdale up about 5000 people, Lancaster up about 3500, since the 2010 census. I’m not saying that people aren’t leaving, just that more people are apparently arriving than leaving. I doubt that there is any demographic, including African American, that is actually shrinking in raw number. I wouldn’t be surprised if African Americans, as a percentage of total, are shrinking, but that’s a result of slower growth, not actual declining numbers. I know way more people who have moved here than have moved away, myself, but my anecdotal evidence is no better than yours. Many bIacks leaving the AV now. Too expensive here. Yes, more and more crime is migrating to Desert View Highlands and Rancho Vista. It’s sad. Not really. This was more of an anomaly. No different than the guy who killed his wife, her parents and then himself in Valencia two years ago. Except for the location, motive, weapon, and pretty much EVERYTHING ELSE. The fact that you can say that they are no different is truly amazing. Thanks, I really enjoyed the laugh. New Palmdale council is soft on crime. Hey… stay away from them horses at the Lazy T… they don’t want your [removed] either. Weird because there’s nothing over there. I wonder if it was some sort of argument related to street racing? maybe it was self defense maybe these out of area people negotiated something and came here with things they should have and a vegilante shot them and stole their goods….